St. Brannock Conclave No. 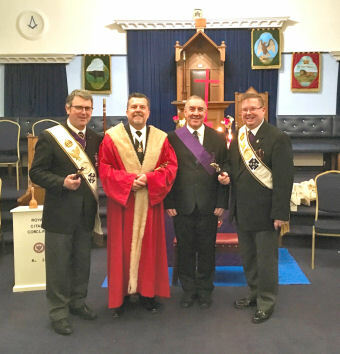 342 Enthronement 17th April 2019 - The experience of a member of the team from Resurrection Conclave put to use for the first time!! 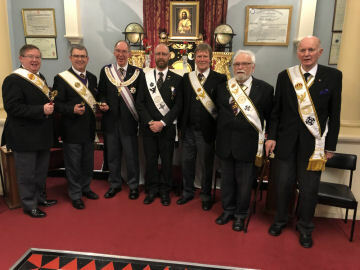 Over 30 knights travelled from all over the Division of Devon and Cornwall to attend the Enthronement Meeting of St.Brannock Conclave in Barnstaple yesterday. Following a warm welcome on a glorious spring day, W.Kt. Brian Taylor was Consecrated as Viceroy by P.Kt. Ian Pollock, and he himself was then Enthroned in a superb manner by the Most Puissant Sovereign, P.Kt. Steve Marshall. 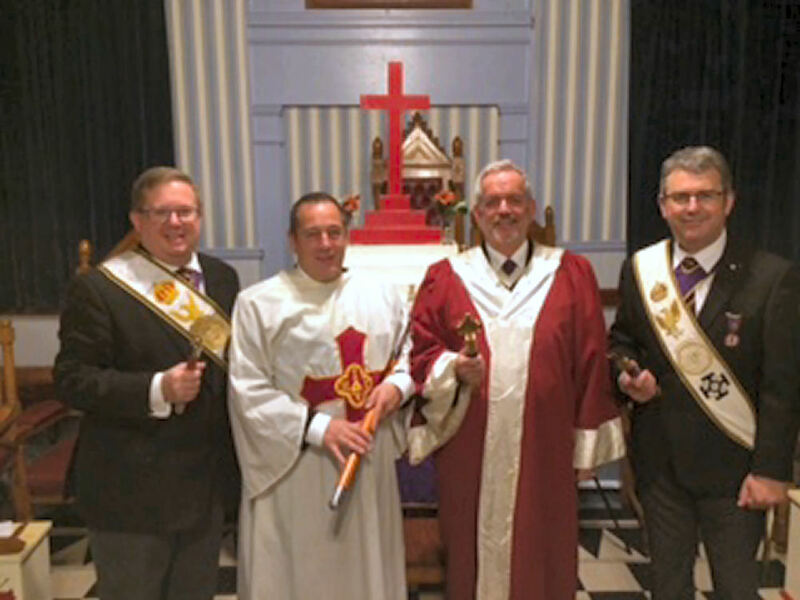 This was the first time that the experience of the members of the newly formed Conclave of Resurrection was called upon to assist a Conclave in carrying out a Ceremony. V.Ill.Kt, Roy Rudling ably assisted in carrying out parts of the ceremony and it went to show how valuable this resource could become! The knights then retired for a most enjoyable festive board and an early trip home. Conclave of the Resurrection No 432 Resurrection Meeting - Thursday 28th March 2019 - A Unique Event!!! Allowing lots of time to arrive at Mount Edgcumbe Masonic Hall we couldn't believe how bad the traffic was in Plymouth - apparently there had been an accident causing everyone to be concerned as the whether they would arrive on time!! One or two stalwarts under the guidance of Andy Paterson had 'put together' the Conclave ready for the ceremony and everyone arrived in time. As none of us had been involved in restoring a Conclave to the roll of Active Conclaves before advice had been sought from various experienced Red Cross Knights and the ceremony began. Our Deputy Grand Sovereign, R.Ill. & Em.Kt. Peter Hawken, M.B.E., G.C.C. took the chair of the Conclave and our Intendant General, Rt.Ill.Kt. Richard Lucas addressed the meeting to ensure that all the knights were aware of the reason for the meeting. Our Divisional Recorder, V.Ill.Kt. Alan Cockman, then read the dispensation from the Most Illustrious Grand Sovereign, and the Deputy Grand Sovereign opened the Conclave in a most efficient manner, which was even more impressive when you bear in mind that his high position means that he never actually witnesses the opening of a Conclave these days!!). Following appropriate salutations, Em.Kt. 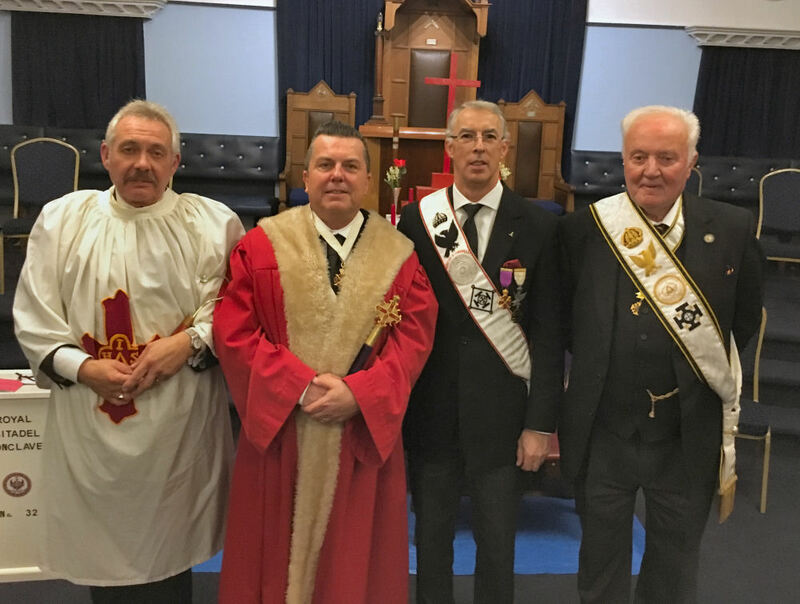 Chris Simons was enthroned as Most Puissant Sovereign of the Conclave of the Resurrection No:432 in a ceremony which, by the nature of the Conclave (being a Past Sovereigns' Conclave) will never be repeated again!! Ill.Kt. John Clendinning was also consecrated as Viceroy. The officers of the Conclave were then appointed and the By-Laws approved. The treasurer gave a report on the finances of the Conclave which he said were satisfactory. 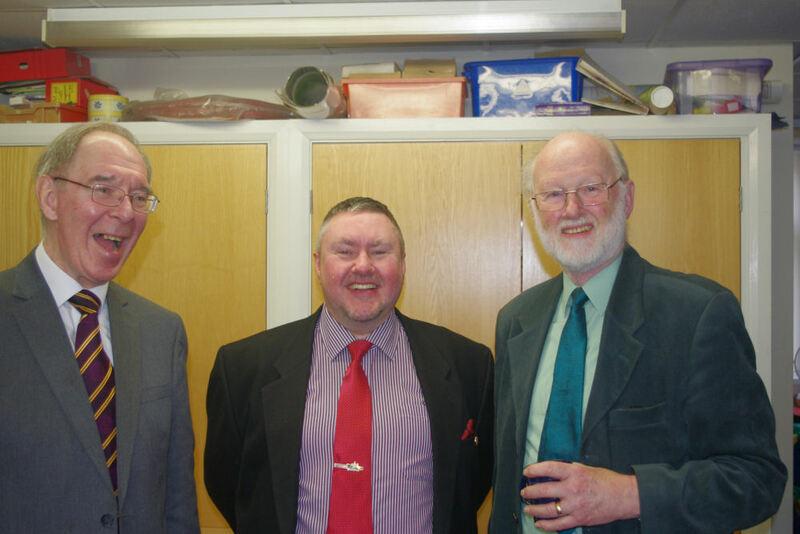 The ceremony was then followed by a most enjoyable festive board with good food, good company and short speeches. Many thanks to all who made this evening happen in such a splendid manner, especially our Deputy Grand Sovereign, R.Ill.& Em.Kt. Peter Hawken, M.B.E., G.C.C. who carried out the ceremony in such an accomplished way. 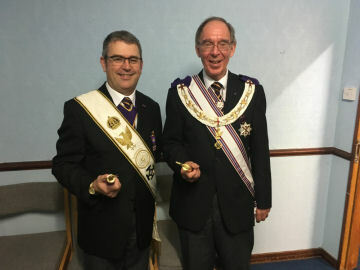 Relying on my Chauffer, Paul Ackland, to ferry me round the Division, I was able to attend the Topsham Appendant Orders meeting last night and join with over 30 other knights in watching a most superb ceremony! The two candidates, W.Kt. Robert Rew and W.Kt. Rodney Walsom could not but have been impressed by the way the first point was carried out by P.Kt. Mike Daniels, the second point by Ill.Kt. Roy Rudling and the third point by Ill.Kt. Paul Ackland. They were well supported by the rest of their team, and it would be difficult to pick out any one of the team who did not excel, and the Sepulchre Guard were very ably led by P.Kt. Andy Paterson. The ceremony was followed by a superb Festive Board and the Company, Speeches and Food were all most acceptable, with many of the knights sporting their 'Red Cross Napkins'!! 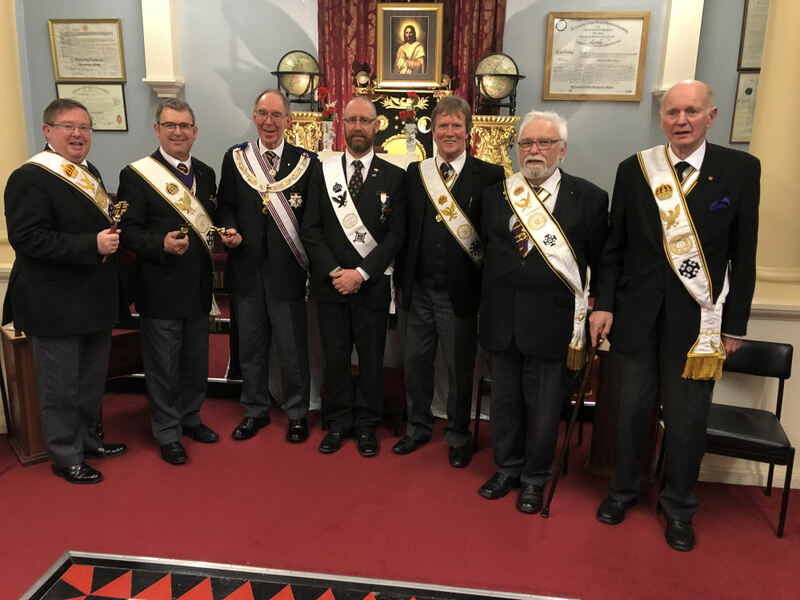 Metropolitan Divisional Meeting in London - Saturday 23rd March 2019. What could possibly go wrong? The day was dry; the roads were clear and despite an early start (5.00am) our Deputy Intendant General set out in good spirits with anticipation of having a great day in the company of many knights from across the country at Mark Masons Hall for the annual meeting of Metropolitan Division under the guidance of Rt. Ill. Kt. Stuart Graves. Even the rendezvous with Ill. Kt. Orme Vince went smoothly and on time at Clyst St Mary. We had an unimpeded journey to Hounslow West tube station arriving in good time, by good fortune met with Ill.Kt Julian Frost Deputy Intendant General from Somerset and set off into Central London. A short walk on a fine day past the Ritz Hotel and down to St James and Mark Masons Hall. We had heard that London was going to be busy that day, but so far, it appeared 'normal' to us. Coffee and biscuits were a welcome sight as we entered Mark Masons Hall, a quick tour of the building for Ill.Kt. Orme, who had not been there before, meeting old and making new friends as we went round. Assembling in the main Temple the meeting began with the customary processions of the distinguished Knights and straight into the business of the meeting. 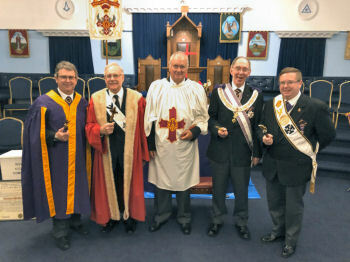 Rt.Ill.Kt Stuart Graves then welcomed and addressed the assembly, thanking everyone for attending and supporting the event, especially the new Knights of the Division who had been installed during the year and who had processed into Divisional Conclave. The Officers were appointed in a lovely manner by the Intendant General and very quickly we were then closing the Conclave and preparing for our lunch. More conversation over a drink then into the meal of Poached Salmon with a delicious parsley sauce and very 'al dente' carrots and cauliflower. After the customary toasts and speeches we bade farewell to our hosts and other knights and prepared for the homeward journey. 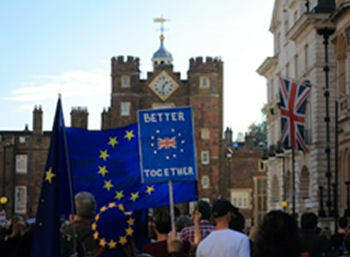 The building in the picture on the right with the Union Flag flying is MMH! Needless to say, we were trying to go against the flow of the masses which numbered into hundreds of thousands (or number of grains of sand on the seashore). We ran into some protesters from Plymouth.... and were looking out for anyone we knew! Green Park tube was now closed and we had to cross the masses to get to streets that would get us to Piccadilly and head home. Ill. Kt. Orme was even less impressed with city life than he had been before. Five of us made the journey from Brixham to Plymouth to attend Royal Citadel Conclave 327 on Friday evening and nice sunny evening it was. 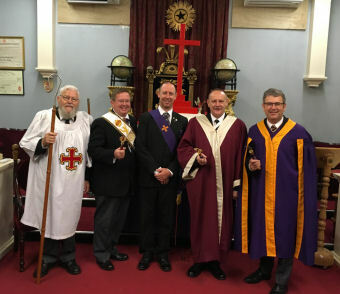 The main event of the evening was to install E Comp Philip Baldry as a Knight of the Red Cross which was carried out by the officers of the conclave with the Most Puissant Sovereign presiding with ill Kt Bill Oats ( marshal ) keeping us under control. Also there was a presentation by Chris and Kevin to the Intendant General Richard of a Cheque from the sale of the Red Cross napkins ( made by Carol Silman ) which was received by Richard with great delight. A wonderful evening was had by all. Over 80 knights and their families took advantage of a lovely spring day to travel to the Fingle Glen Golf and Country Club to enjoy the Red Cross Spring Lunch on Sunday 17th March. Because I am unable to drive at the moment due to a hip operation three weeks ago I was lucky enough to be offered a lift by Margaret and Brian Taylor who chauffeured me down from Barnstaple and who generally ensured that I didn't fall off my crutches on my first public appearance! Arriving at Fingle Glen with plenty of time to get some refreshment and to catch up with the news of old friends, and particularly to renew acquaintances with their wives and families, it soon became obvious how popular this event is with at least six heads of Orders present as well as many 'past' heads and V.I.P.s including our Deputy Grand Sovereign, R.Ill. & Em.Kt. Peter Hawkin, M.B.E., G.C.C. and his lovely wife Wendy. Indeed, the only noticeable absentee was the very man who organised the whole event, V.Ill.Kt. George Evatt who was away on a cruise 'up North' to see the Northern Lights! The food and service was as good as we have come to expect, and the atmosphere in the downstairs 'Room 19' made the whole lunch most enjoyable and we ere on our way home by 3:30 after have had a most enjoyable time. 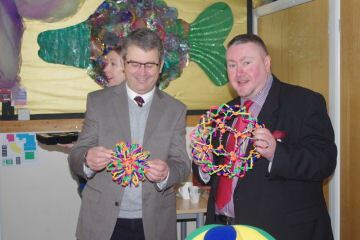 Thanks to Philip Adams for taking the photographs!! An evening not to be missed!! The big day is about to arrive!! The Conclave of the Resurrection No. 432 is about to be Resurrected!! 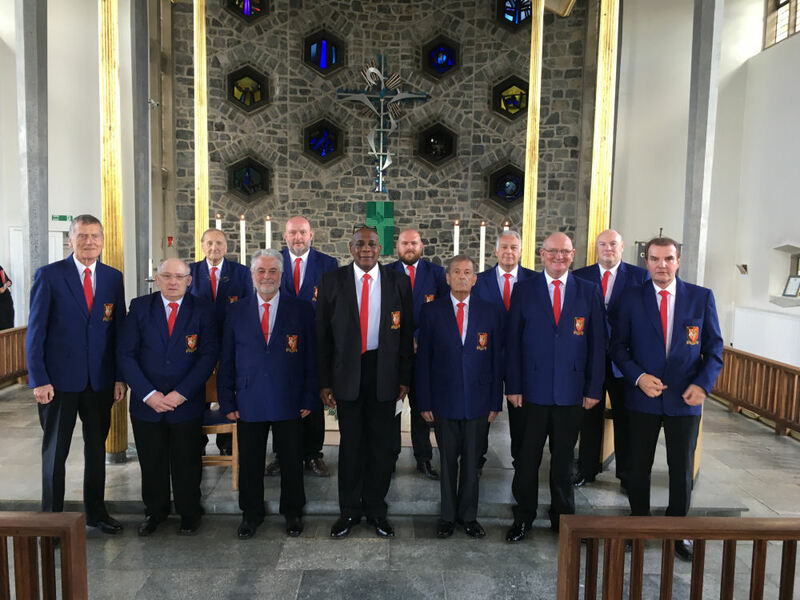 27 Red Cross Knights have now 'signed up' to become members of the re-formed Sovereign's Conclave, the Conclave of the Resurrection No.432. The Grand Sovereign, Most Ill.Kt. Graham Flight, G.C.C. 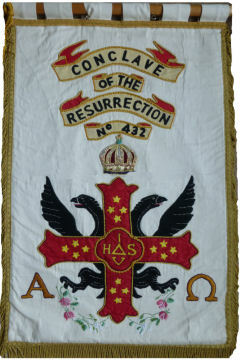 has been pleased to restore the Conclave of the Resurrection No.432 to the Roll of Active Conclaves and R.Ill. & Em.Kt. Peter Hawkin, M.B.E., G.C.C., the Deputy Grand Sovereign has kindly agreed to act as the Consecrating Sovereign. The whole event will take place at Mount Edgcumbe Masonic Hall on Thursday 28th March at 6:30 pm. May I be cheeky and use this web page to thank everyone for their kind wishes and their concern for my well-being following the replacement of my hip a couple of weeks ago! After a lot of pain in the early days it all seems to be coming together - slowly but surely, and no small measure to the wonderful and patient nursing of the lovely Sandy! A couple of small problems - the pair of crutches that the hospital gave me seem to have a mind of their own - one goes one way and the other seems to do exactly the opposite. Also they gave me a contraption to assist my progress in the lavatory, unfortunately because geometrically it has to fit inside the existing bowl, how on earth do you get your hand inside the whatever bowl is left over to carry out any necessary duties?? Anyone who has used one of these will know exactly what I mean! Never mind - it will all be worth it in the end, and once again, many thanks for all your kind wishes and I hope to see you at the Spring Lunch. 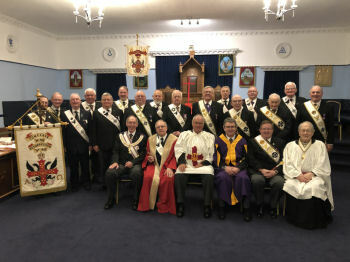 A grand gathering of Divisional Officers and members of the Conclave assembled in Tavistock for the Official Visit by the Intendant General to the Conclave. The conclave was also further honoured by the presence of the Deputy Grand Sovereign. Rt Ill and Em Kt Peter Hawken. 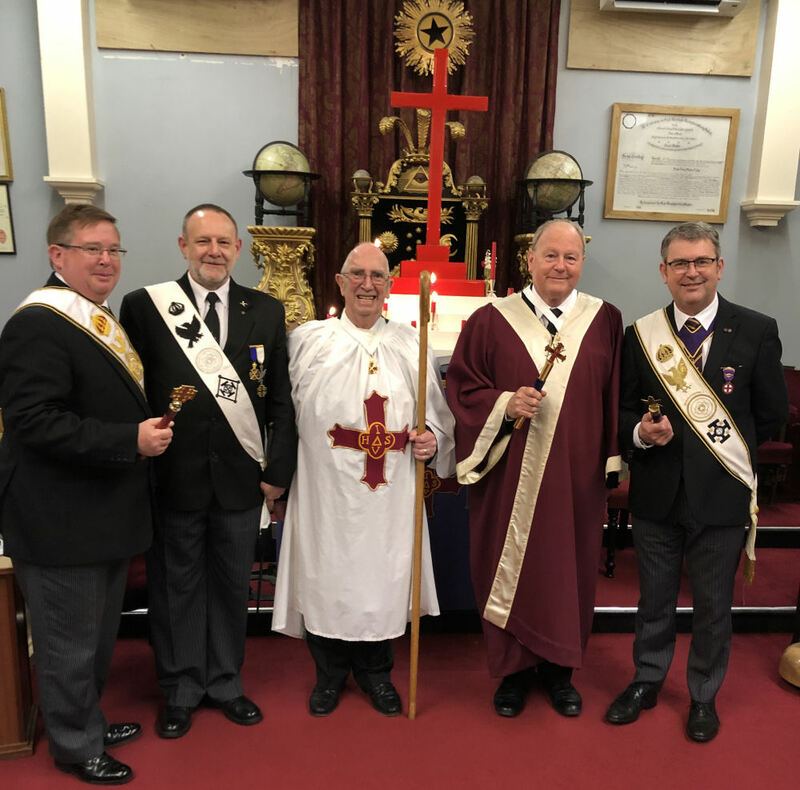 After opening the Divisional party were admitted with full ceremony and Sepulchre Guard under the orders of the Deputy Captain of the Guard, Pkt Peter Durrant providing an Arch of Steel. Salutations were given by the Marshall V.IllKt Roy Rudling and his Deputy Ill Kt Arthur Barker. This being the last meeting before the Enthronement it was a business meeting where the Puissant Sovereign for the ensuing year was elected. Em.Kt. Gary Peard suitably responded. The Viceroy was also elected and W.Kt. Wakeham also suitably responded. Our Intendant General then gave a short paper concerning the 12 Grand Points of the Cross that he had been given to him by the Intendant General of the Benelux Division. A detailed paper, our Intendant General focussed his talk to the involvement of Helena, the mother of Constantine, and her researches into the Cross of Calvary upon which our saviour died. The Most Puissant Sovereign Pkt. Roger Pulleyblank thanked the Intendant General for his contribution and for managing the pronunciation of so many awkward words. It was then the turn of the Deputy Intendant General to present WKt, Jonathan Davey with his Grand Imperial Conclave Certificate which was done in style covering the most salient points of the document. The Deputy Intendant General once again welcomed W.Kt. Davey to the order. This item was swiftly followed by the Deputy Grand Sovereign presenting W.Kt. Jon with his Appendant Orders Certificate which was done in his usual warm and welcoming fashion. The Deputy Grand Sovereign also welcomed W.Kt. Davey to the order wishing him many years of happy membership of this Christian order. 'One misty, moisty morning….' (old folk song) Well, that was how it seemed down by the river on leaving home at 06.50 on the way to pick up V.Ill. Kt. Keith Jackson and then on to meet our Intendant General for the onward journey to Bridgend for the Annual Conclave of South Wales Division. As we travelled further north the sunrise through he mist was spectacular and it all started to clear up. A quick coffee stop (but no Yum Yums!) and soon we were crossing the Bridge into Wales, with the rugby traffic. Very different entering the Principality without having to pay! Meeting up with old friends at Bridgend is always a delight. The welcoming party including our Senior General Pkt Tony Moyle who asked where PKt. Orme Vince was his name being on the list of guests. Concerned looks were passed between our IG, DIG and Grand Historiographer. It became clear that there had been a bit of a slip up. Images of Orme sat in his car, lonely and waiting, sprung to mind. Ooops! The meeting proceeded with good humour and many references to the local event happening in Cardiff and the need to be prompt in managing the business so that those that had tickets could get to the match. I'd forgotten how hard it is to wake up at 6:00 in order to meet our Intendant General at Tiverton Parkway on our way to attend the West Midlands Divisional Meeting at Kings Heath in Birmingham. But the memories soon came flooding back as I battled with the interminable 30mph speed limits on the North Devon Link Road, and, after meeting Richard, the inevitable stop for coffee and 'yum yum' type snacks at Taunton Services. We arrived at Kings Heath with plenty of time to spare and were warmly greeted by Rt.Ill.Kt. John Tristam and his team. Refreshments were waiting for us - including 'Bacon Butties' (I wished I hadn't had that chocolate 'yum yum'!). And we were soon greeting old friends from across the Country, catching up on news, and putting right what's wrong with the world. The meeting then started with the Rt.Ill. Intendant General welcoming everyone, especially his distinguished guests from far and near, and especially The Grand Eusebius, Rt.Ill. & Ven. Kt. The Rev'd Timothy John Nicholas L'Estrange, GCC. The usual business of a Divisional Meeting was then conducted in a superb manner by Rt.Ill.Kt. John Tristam despite his having a severe cold, and by 1:00 o'clock we were partaking of refreshments prior to our lunch. 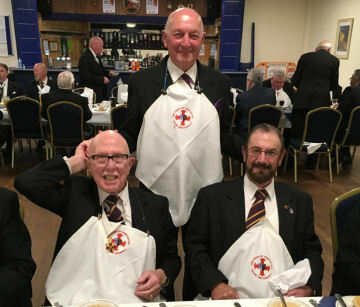 The lunch was followed by short speeches, with the response by the Grand Eusebius being most entertaining and finishing with the comment that " The Red Cross Degree is a Degree that Unites our Masonic Principles with our Christian Faith"! A quick trip back in Richard's Chariot, home by 6:00 followed by an email from Richard to say that his beloved had made him Ham Egg and Chips. Sandy went out into the kitchen promising me a surprise snack and returned to give me the address of the local fish and chip shop!! 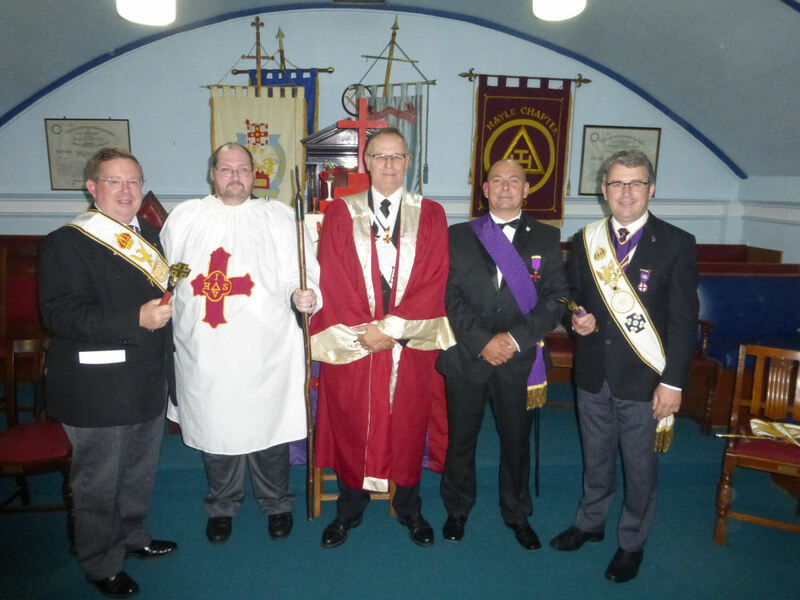 And as for what's wrong in the photo taken at Barnstaple Appendant Orders??? Only one person noticed that the candidate is wearing a sash with a crown on it! Well spotted Ed! St. John the Evangelist Meeting at Topsham - 4th February 2019. The fog gathering did not prevent the intrepid Knights of the Division from mustering at the St. John the Evangelist Conclave. 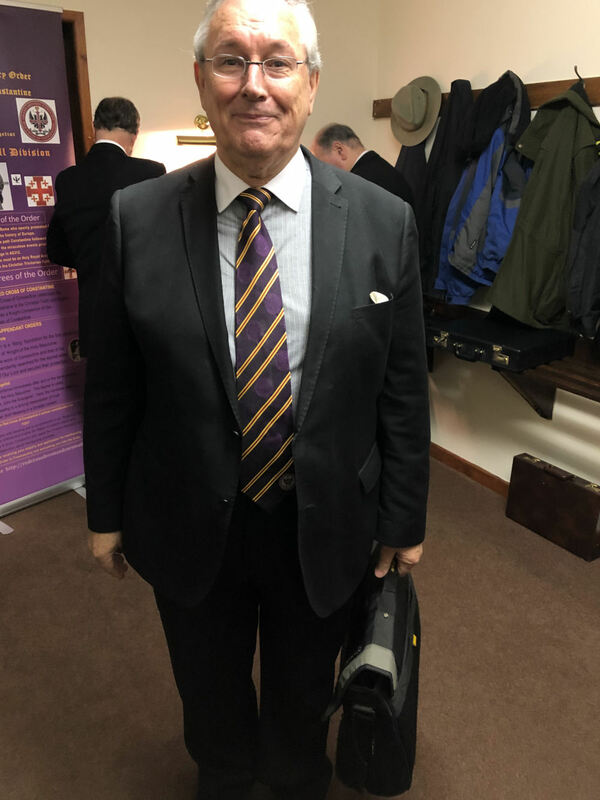 Once again our Divisional Senior General, Tony Moyle travelling from the depths of Cornwall to attend another superb evening of Christian fellowship. The company also included our Deputy Grand Sovereign, Rt. Eminent Knight Peter Hawken and officers of the division both present and past. The most puissant sovereign, P.Kt. Alex Barahona-Wills, Divisional Chamberlain, opened the conclave with the assistance of his Viceroy, P.Kt. John Lynes. The Most Puissant Sovereign proffered his Baton which the Intendant General declined to accept, with his good wishes for a successful meeting. 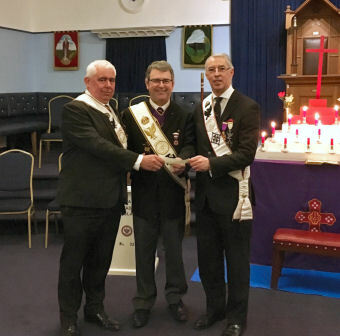 The Deputy Grand Sovereign was then admitted, saluted and also offered the Baton of the Conclave, which was again declined by the Deputy Grand Sovereign. 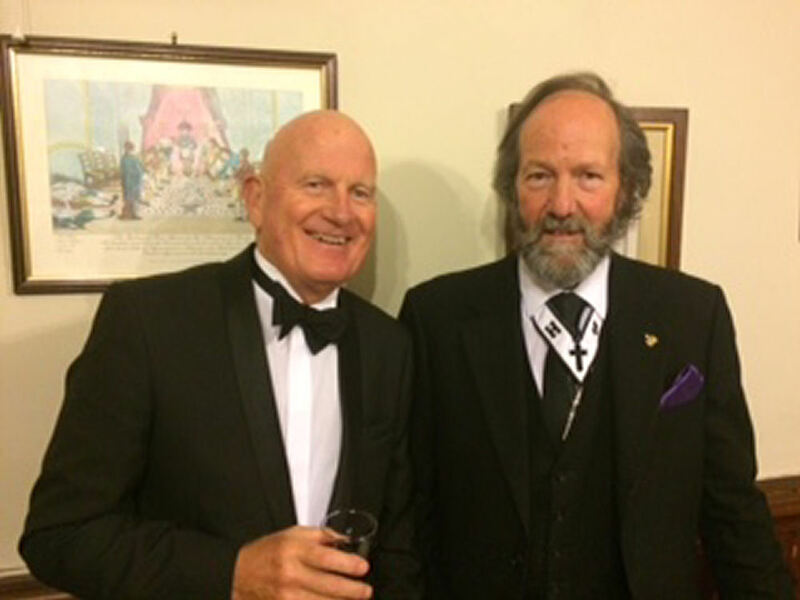 Accepting his responsibility, the Most Puissant Sovereign then moved to the Installation of Companion Rodney Walsom into the order with the assistance of W.Kt. Philip Adam as Preceptor, the accolade was delivered by the Deputy Grand Sovereign and an excellent Oration by W.Kt. Bill Richardson. Now a W.Kt, Rodney was heartily welcomed into the Order. 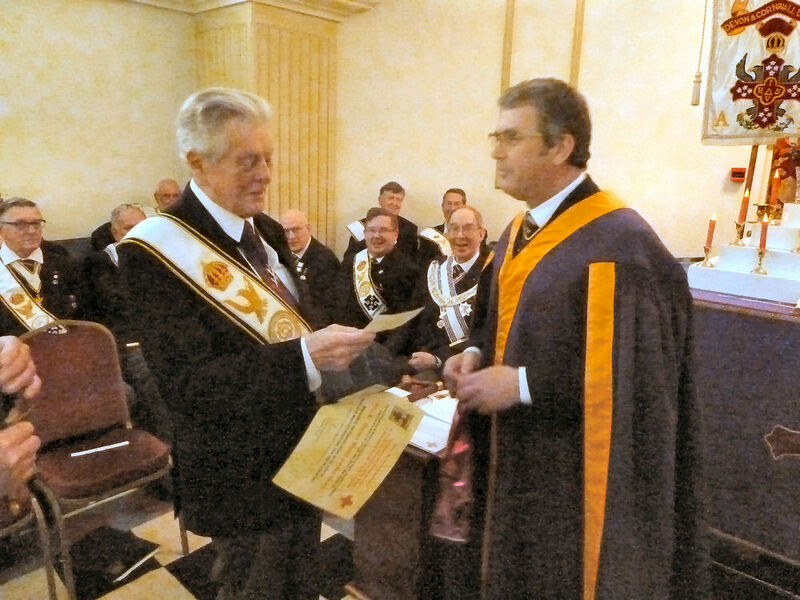 Following the ceremony there was a presentation of a Grand imperial conclave certificate to W.Kt. Robert Rew by the Deputy Intendant General. W.Kt. Rew was congratulated and was looking forward to the Appendant Orders in March. St John the Evangelist has also had two joining members this evening, Ill.Kt. Alan Hext and W.Kt. Brian Ludford, both were welcomed by the Most Puissant Sovereign who congratulated them on joining St John the Evangelist. n retiring in procession, we enjoyed a delicious meal, good company and succinct speeches. The journey home was much clearer! Barnstaple Appendant Orders - Tuesday 29th January 2019 - Can you spot what's wrong in the photos? 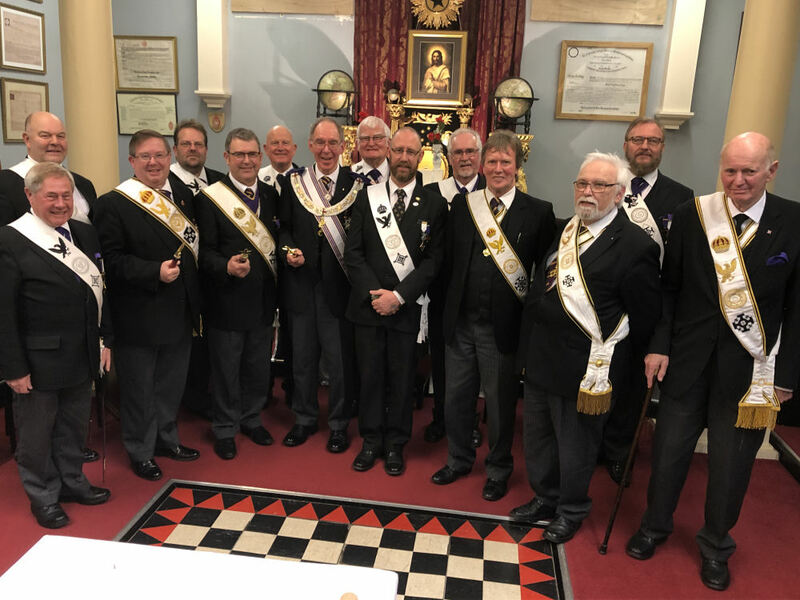 On a cold January night, with ice and sleet forecast for Devon & Cornwall nearly 40 knights braved the weather and travelled to Barnstaple for the Appendant Orders there. Our Divisional Grand Commander, Rt.Ill.Kt. 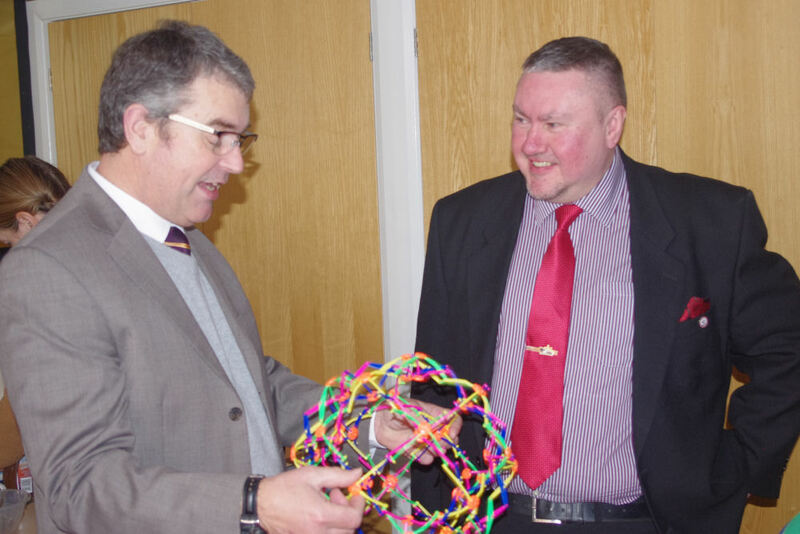 Richard Lucas was joined by our Deputy Divisional Grand Commander, Ill.Kt. Nicholas St.John White, our Deputy Grand Sovereign, Rt.Ill. & Em.Kt. Peter Hawken, M.B.E.,G.C.C., and many Active Divisional Officers, together with the Sepulchre Guard under the excellent leadership of P.Kt. Peter Durant. After a warm welcome the ceremony set off in excellent style with V.Ill.Kt. Roger Duffett conducting the 1st Point, Ill.Kt. Gwyn Thomas conducting the 2nd Point and Ill.Kt. Paul Ackland carrying out the 3rd Point, all of whom carried out their part of the ceremony in a most excellent manner which I know greatly impressed our Candidate, W.Kt. Michael O'Meara. 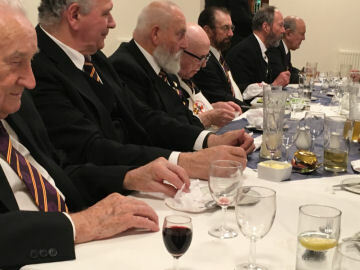 Following the ceremony we retired to a most enjoyable Festive Board with good company, good food and short speeches, and our visitors were able to get away just after 9:00 o'clock. And have you noticed what's wrong in the photo? I'll let you know when I next see you! Red Cross Divisional Napkins will be available at the Appendant Orders Meeting at Barnstaple on Monday 29th January. I've just been contacted by the man who runs the St. Marychurch Masonic Lodge where we held our Annual Divisional meeting and he has "come across" a set of Red Cross Regalia consisting of a Puissant Knight's sash, medal and a Appendant Order medal. If you've lost such items, or you know anyone who has, could you please let me know? It was due to be a ‘quiet night’ at Holy Trinity as the expected candidate had unfortunately not been available. We also learned that the MWS Simon Wills wife had been taken seriously ill, as the past Sovereign, David Ellis P Std.B (L) stepped into the breach with E.Kt. Paul Lloyd as Viceroy and a team of members of the conclave supported by visiting knights filling various offices. The conclave, not expecting much were then delighted when Rt.Ill. Kt. Richard Lucas, Intendant General and his Deputy Ill.Kt. Nic White, offered to provide a couple of items that they hoped would provide some interest and advance masonic knowledge. The Deputy Intendant General then gave a short talk based on the Divisional History booklet and other researches about the founder of the Order, Robert Wentworth Little. The Deputy was also able to link his talk to the issues of recruitment that we continue to face today. Our Intendant General then gave a talk about the use of some of the terms that we use in our rituals and explored their wider meanings. Both talks were well received by the Conclave. We then retired for a delicious festive board, good companionship and short speeches. Our thoughts and prayers were with Simon and his family at this very difficult time. It was noted that the Deputy Intendant General refrained from going anywhere near the windows in the refectory after his last visit! 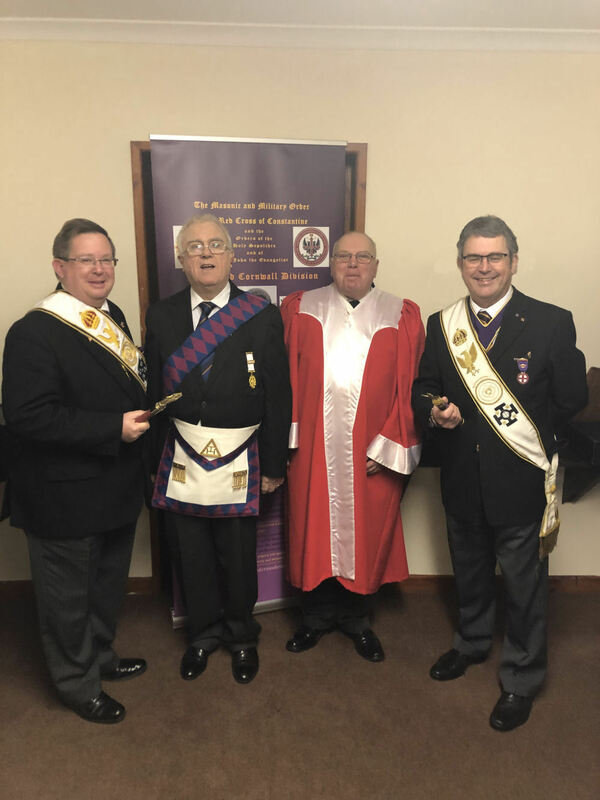 Joseph of Arimathea Conclave No.253 Meeting - Friday 4th January 2019 - how many Masons does it take to change a light bulb? - and the failed washing powder! 30 knights from across the Division, including nine active Divisional Officers, travelled to Perranporth on Friday 4th January for the first meeting of the year, and what a warm welcome they received on a cold winter's night. After swapping all of our Christmas stories, which included the tale of how one Mason got into trouble changing a light bulb and another whose washing powder failed, we settled down to be treated to a super ceremony by the Most Puissant Sovereign P.Kt. Colin Rescorla and his team when they installed E.Comp. Phillip "Chris" Duddleston as a knight of our Order. Both P.Kt. Graham Hooper, the new Recorder, and P.Kt. Graham Jose, the new Marshal took to their new jobs with great professionalism, but the real 'star of the evening' had to be E.Kt. Peter Johns who deliverd the Oration in a way that not only impressed the candidate but also the other knights watching! 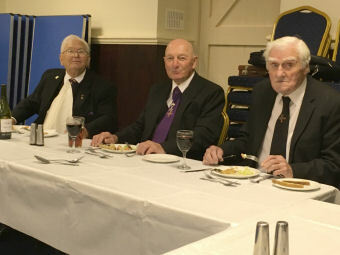 The knights then retired for a most enjoyable festive board. And the light bulb and washing powder? Apparently the Em. Viceroy, P.Kt. Frank Jewell is a little bit accident prone - whilst replacing a bulb in his car he managed to dislodge the front wing trapping and damaging his arm . He managed to follow this with an incident in the Lodge which I promised him I wouldn't mention! And, a very well known knight who, to save his embarrassment I shall only refer to as 'Fred' (but is the Divisional Sub Prelate) had obviously chosen the wrong washing powder - his 'whiter than white' shirt displaying an definite hint of grey!! Another great night at Perranporth and an enjoyable start to the new year! 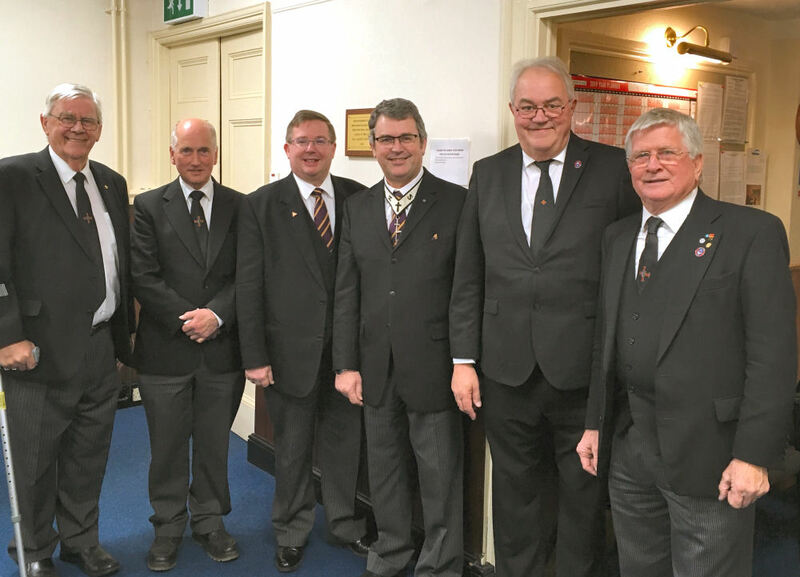 As the Conclave will be peripatetic, the installation meeting will always be held in March at the Mount Edgcumbe Masonic Hall, Plymouth, with the second meeting being held as directed by the current Sovereign in office. Dave Silman - is his football future finished??? When Dave went up to get his appointment as Junior General at the Divisional Meeting last Saturday at Torquay, nobody could have guessed the pain that he was in! Apparently Dave had already had a knee replacement on his right leg several years ago which was feeling its age more that Dave was! But a new knee was awaiting him. Bright and early on Thursday Carol ferried Dave to hospital and the long hospital wait began. At 7:00pm Dave was finally 'worked on'! And whilst the operation was successful it took much longer than forecast because of problems caused by his old implant and the cement there around. Carol tells me that Dave is tired but fine, however won't be home for a day or two because of the complications. Dave - you take care of that knee and don't be a nuisance to Carol!! On Thursday 222nd members of the Masonic Order of The Red Cross of Constantine and their wives, one of the orders in Freemasonry, were delighted to be able to go back to School for a special occasion. They were at Eggbuckland Vale Primary School and Nursery to present a cheque on behalf of the Order from the 'Grand Sovereign's Care for Children Fund'. Eggbuckland Vale Primary School and Nursery in Plymouth received a £2,500 cheque from the representatives of the Masonic order Devon and Cornwall Division of the Red Cross of Constantine during a recent school visit. Staff at Eggbuckland Vale Primary School have used the money from the charitable fund to develop a sensory room in school. 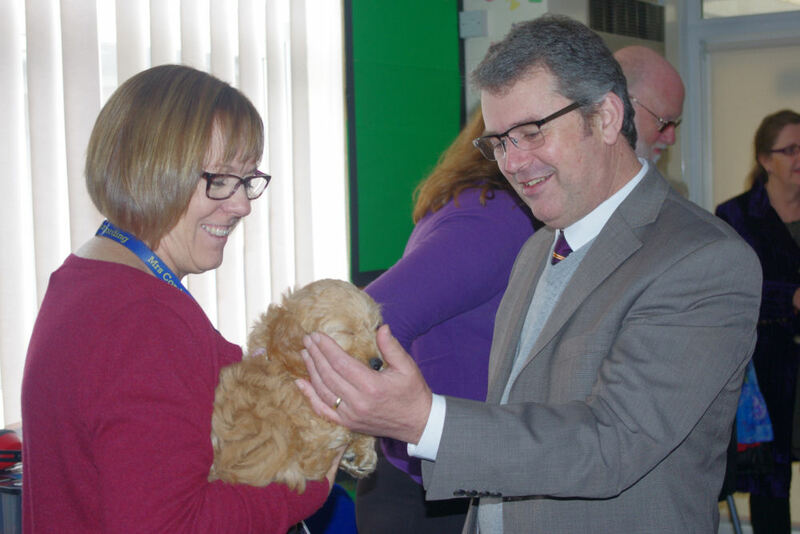 This will have an important role to play for many children as it will provide a therapeutic environment for children with autism and other special educational needs. It will be a space where children learn to manage their emotions in a controlled environment, without feeling they are being isolated or punished. In addition to creating a sensory room, the funding has enabled the school to provide a sensory kit for 17 classrooms that contains a variety of sensory tools and resources that can be used to both calm and stimulate a child's sensory system. Mrs Wendy Cording , Head teacher stated: "We would like to thank all the members of the Red Cross of Constantine - who by awarding us with this cheque will enable us to make a huge difference to many vulnerable children". The Deputy Grand Sovereign, Peter Hawken, the Intendant General for Devon & Cornwall, Richard Lucas with his Deputy Nicholas White, their wives and the Charities Manager Darren Coleman from Mark Masons' Hall in London were excited to see some of the equipment that had been purchased using the donation at the presentation event. Divisional Meeting at Torquay 24th November 2018 - Bernard gets a surprise! An early start to get down to Torquay by 9:00am to set up the Divisional Grand Conclave. The Sepulchre Guard and Knights to be invested were soon arriving (perhaps they had already heard of Tim Singleton-Green's superb Breakfast Buffet awaiting them! With Ill.Kt. Dr. Warner Barton, who had helped so much the day before in setting up the Conclave, ever ready to help with any problems that may arise, and the rehearsal under full swing, it's amazing how, after so many months of preparation the Divisional Meeting seemed to take on a life of its own! Then the Distinguished guests started to arrive, many having driven long distances in very heavy rain! Our Intendant General, Rt.Ill.Kt. Richard Lucas and our Deputy Intendant General Ill.Kt. Nic. St.J.M. 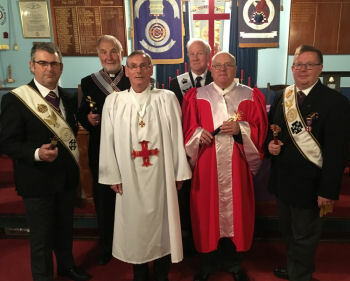 White were on hand to welcome everyone who had travelled to Torquay, 84 Knights in all, and we were soon changed and ready for the opening of the Divisional Grand Conclave. Two processions took place under the watchful direction of our Division Marshal. Ill.Kt. Paul Ackland and his Deputy, V.Ill.Kt. Roy Rudling, the first of distinguished guests and the second of our Intendant General with his active officers. Salutations were then given followed by a a brief but humorous welcome and introduction to our guests by Rt.Ill.Kt. Richard. The Deputy Grand Sovereign, R.Ill. Em. Kt. Peter Hawken MBE GCC then entered the Conclave with all due pomp and ceremony. The rest of the business of the meeting was then carried out swiftly and efficiently. Under 'Any Other Business the Intendant General asked the Divisional Marshal to present a somewhat surprised V.Ill.Kt. Bernard Winsor to him. The past Captain of the Sepulchre Guard was then led (probably for the first time ever) under an Arch of Steel provided by the Guard and was presented to R.Ill.Kt. Richard, who formally thanked Bernard for all of his work and efforts as Captain of the Guard since 1999. He then presented Bernard with a Certificate acknowledging his work, an engraved firing glass, a bottle of something and a gift from the Sepulchre Guards past and present. V.Ill.Kt. Bernard was almost lost for words!! 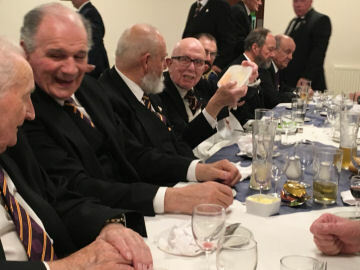 Following the meeting 78 knights retired to the Anchorage Hotel for a most convivial and enjoyable Festive Lunch with good food, good company and short speeches! Another lovely Autumn morning and a drive down to Bodmin with Roger Duffett as good company to visit The Conclave of Light for its daytime meeting. What else could a good Christian Knight want? P.Kt. Andy Paterson greeted all of us as we arrived at the Conclave and, in the absence of a 'live' candidate asked W.Kt. David Lloyd to stand in (his thrid time as a candidate!!). 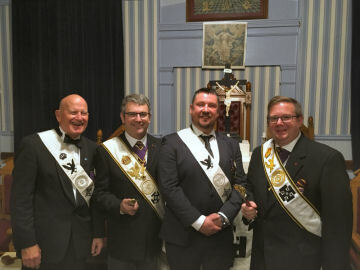 After welcoming the knights from Ascension Conclave No.499 P.Kt. Andy proceeded with the re-enactment ceremony, which he and his team carried out in a superb fashion, all under the supportive gaze of our Deputy Intendant General Ill.Kt. Nic. St.J.M. White. The rest of the business of the Conclave was then carried out which included a summary of the Conclave Accounts. We all then retired for a superb festive buffet. How come every time I go to The Conclave of Light the sun is shining?? 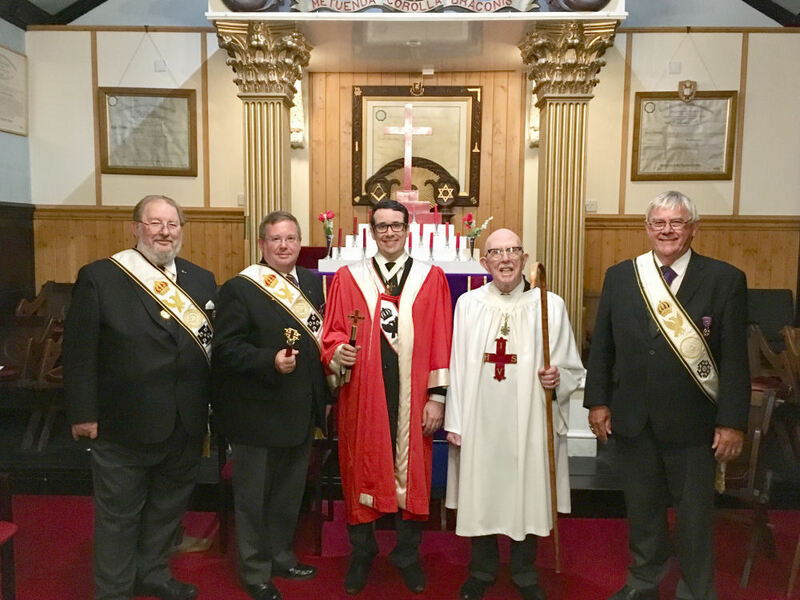 St. John the Evangelist Conclave No.238 Meeting - Tuesday 6th November 2018 - The Magic of Masonry! I was working on my computer trying to finalise the details of our Annual Divisional Meeting when the phone rang. It was Mike Daniels, the Marshal of St John the Evangelist Conclave who's meeting I was about to attend later that day. He told me that their Sovereign had been taken ill and that he had no-one to fill his place as several other members were also not attending. Then I came up with the bright idea of asking that old 'war horse' John Lynes (the current Viceroy of the Conclave) to act as Sovereign. Mike said "that's a good idea, but then who can I get to act as Viceroy?". It was at that point that I realised that I'd 'dropped myself in it"! Which is how I ended up in a white smock, reading from the ritual book as Viceroy! On a wet and stormy November evening 26 Knights joined our Intendant General, R.Ill.Kt. Richard Lucas and our Deputy Ill.Kt. Nic. St.J.M. White to watch another superb performance by Ill.Kt. John Lynes (and a not so superb performance by yours truly). John and his team quickly dealt with the business of the evening which included the successful ballot for two joining members, P.Kt. 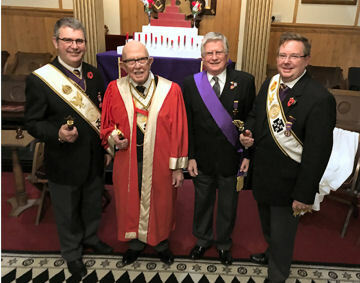 Ralph Frederick Day and P.Kt Andrew Yelland and then proceeded to install Companion Robert John Rew as a knight of our Order. Despite there being several officers absent and the necessity of press-ganging some visitors The 'Magic of Masonry' ensured that it was a most successful ceremony, and the festive board after was enjoyed by all. First appearance of the new Red Cross Divisional Napkin. A Napkin with the Red Cross of Constantine Devon and Cornwall Logo beautifully embroidered upon it is now available to our members. The Napkin, lovingly designed and made by Mrs Carol Silman, is being sold at £7:00 and the funds raised will go towards the Intendant General's fund for use in emergencies to provide immediate assistance to those in distress. Contact P.Kt. Chris Thomas or P.Kt. Kevin Jones to purchase one of these beautiful items. Royal Citadel Enthronement - Monday 23rd October 2018 - 30 mph from Barnstaple to Plymouth!! Barnstaple to Plymouth normally takes and hour and a half, but last night we came across earth moving lorries, a horse trailer with a flat tyre, a car out of 'Thunderbirds' with a FAB registration, a learner driver, cyclists and several others who all had one thing in common - they were all incapable of travelling at any more then 30 mph! We finally arrived at Royal Citadel with five minutes to spare but combination lock wouldn't work until I remembered that you had to push the button on the bottom of the lock! Fourteen knights parade into the Conclave under an Arch of Steel provided by the Sepulchre Guard under the direction of E.Kt Barry Slade (his first time of being 'in charge') and the Conclave was then honoured by the presence of R.Ill.Kt. Peter Hawken, MBE GCC, the Deputy Grand Sovereign. Forty Knights from all over the Division of Devon & Cornwall joined our Intendant General, R.Ill.Kt. Richard Lucas for the Ceremony to watch the Most Puissant Sovereign, M.P.Kt. Chris Thomas enthrone his successor, E.Kt. Nigel Frude who had previously installed W.Kt. Norman Yarde as Viceroy. Both ceremonies being carried out faultlessly and in a superb manner. We were then given treat as Deputy Grand Sovereign presented Appendant Orders Certificates to W.Kt. Royston Lucas, W.Kt. David Farley and W.Kt. Andrew LeGrys in a most informative and relaxed manner, especially bearing in mind that he had only been given a day's notice. Following the other business of the evening we all retired for a most enjoyable festive board with good Christian Company, many who were wearing the new Napkin. And there's always something different going on at our meetings - why is John Lyne gathering cheese in a plastic box? does he have a new cat? and guess which VIP had to buy a bottle of Port because his phone rang in the Temple! - Answers on a postcard please, the funniest answer will win the Christmas Quiz!!! An early start after a stormy night with the tail end of Storm Callum coming through the South West started the day for the Deputy Intendant General, Ill.Kt. Nicholas White as he struck out along the Jurassic coastline (mostly on the A35) to Wareham for the Divisional Meeting of Dorset and Wiltshire. The journey, which as many of you know, is along some beautiful scenery with glimpses of the sea and rolling hills from Devon into Dorset, past the Moore's Dorset Knob bakery just past Dorchester and turn right onto Wareham, was accompanied by sun, rain and a good helping of wind! Arriving in good time to meet with fellow Knights from across the country, Durham, Northumberland, Nottingham and Surrey to name but a few, to restore one's personal comfort and have a coffee before the meeting started. R.Ill.Kt. Mathew Burt, Intendant General welcomed all his guests and members of his Division present. The proceedings started with the Annual Service of Rededication of the Division, a moving ceremony conducted by W.Kt. K.H Barnes the High Prelate who gave the address. We then moved to the Divisional meeting business where R.Ill.Kt Burt conducted the agenda swiftly and efficiently. He thanked his officers of the year for their support and proceeded to appoint and invest new officers for 2018 - 2019. At the closure of the Divisional meeting we retired to the refectory where we were treated to a delicious festive board that was topped off with Spiced Dorset Apple Cake. After the customary toasts and speeches we departed in Christian fellowship at the end of this delightful and thought provoking meeting. I think that the Christmas Quiz this year should be :- What do you call a group of Deputy Intendants General? - Answers on a post card please! This came about because at the Enthronement Meeting of St. Ercus Conclave last night at Hayle there were four Intendants General (three of whom were past). And one of them became the Sovereign of the Conclave! 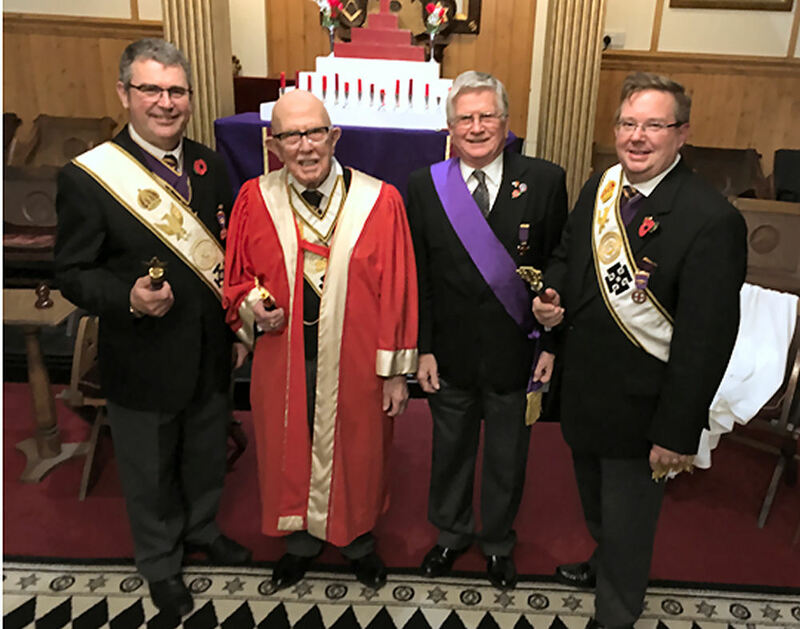 It's no secret that St.Ercus have had a few problems recently but the strength within the Conclave was very apparent last night by the teamwork that pulled everyone together to give us a most delightful and enjoyable ceremony. After the initial business of the meeting had been carried out, W.Kt. 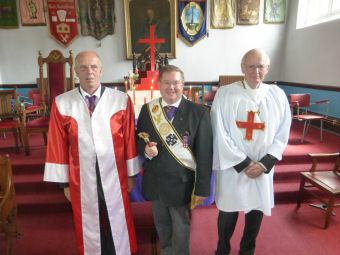 Paul Roberts was Consecrated in a most superb manner by Ill.Kt. Keith Waters, especially bearing in mind that he had stepped in at the last minute and was given only two days to learn the ceremony! Ill.Kt. Keith was then installed as Most Puissant Sovereign in a faultless manner by the M.P.Kt. Paul Goody. The whole enthronement was a wonderful example of teamwork and cooperation between the members of St. Ercus and also the visitors! Ill.Kt. Nic. St.J.M. White then presented a certificate in his usual relaxed and unique style. The meal following the meeting was enjoyed amongst good Christian Knights and the whole evening was an example of Freemasonry at its best!! 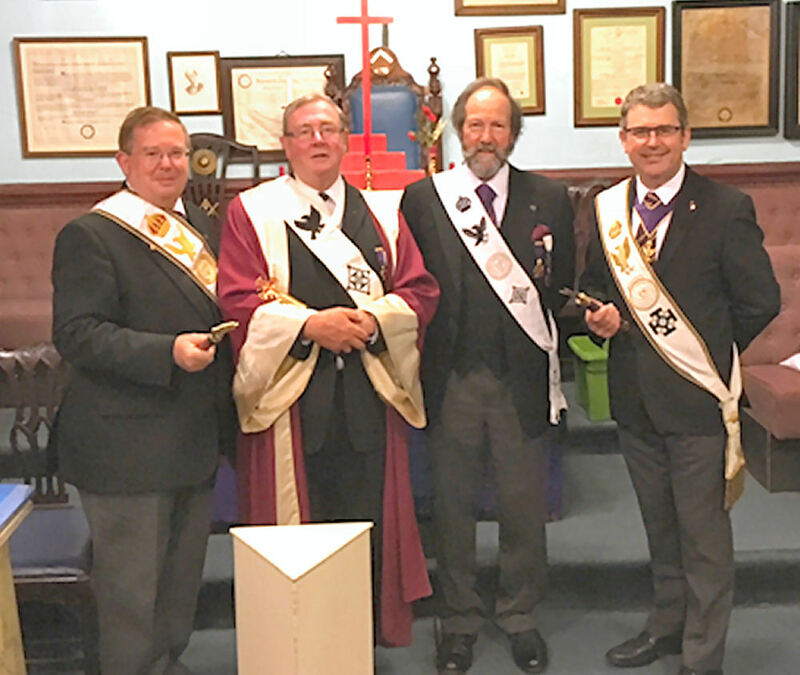 Torquay Appendant Orders - Thursday 4th October 2018 - We had a Smashing Time!! Over 30 knights from across the Division made the trip to Torquay for the Appendant Orders ceremony on Thursday 4th October. This immediately followed the annual executive meeting in which the Divisional accounts were presented and Official Visits and location of the Spring Lunch were decided. The Appendant Orders ceremony started somewhat hesitantly, with one of the candidates arriving at the very last minute and one of the candles refusing to light - this was quickly corrected by the Marshal. Ill.Kt.Dr. Warner Barton who, in the absence of any other tool, drew his sword and with a rapid 'Zoro' flourish quickly trimmed the candle! The ceremony then proceeded in an excellent manner, with V.Ill.Kt. Roger Freeman as Prelate 1st Point, Ill.Kt. Warner Barton as Prelate 2nd Point and Ill.Kt. Richard Baber as Commander. The Candidates, Kt. Adam Raw from Royal Citadel Conclave and Knight Jon Davey from Mount Lebanon Conclave (who had only been installed as a knight of our order eleven days earlier) could not but have been impressed with the whole ceremony which was enhanced by the presence of six members of the Sepulchre Guard under the direction of their captain, P.Kt. Peter Durrant and the Divisional Grand Commander, R.Ill.Kt. Richard Lucas who carried out the accolade assisted by his Deputy Ill.Kt. Nic,. St.J.M. White. 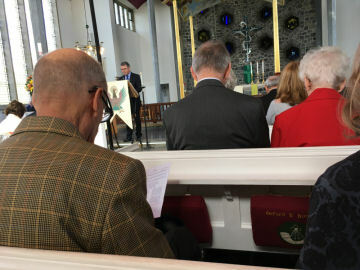 I was sitting next to one of the Candidates, Jon Davey, and in conversation it transpired that he had moved to Tavistock from Majorca but had maintained his connections with Freemasons on that Island. 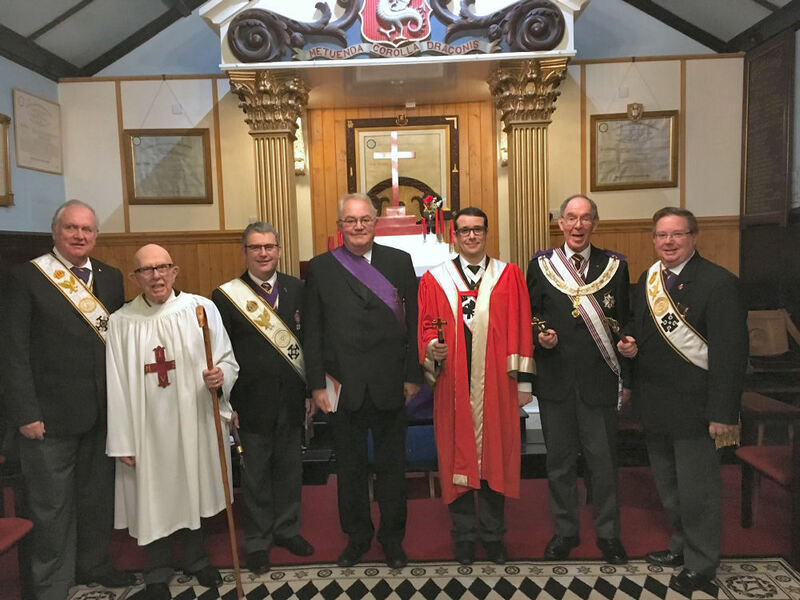 He announced that the following day he and other local masons were travelling back to Majorca on a Masonic Visit to Pythagoras Lodge partly to commemorate a visit by another Devon Lodge over twenty years ago to Majorca. I was delighted to tell him that I was on that trip, and Jon promptly produced a Masonic magazine from 1997 in which the top of my head could be seen behind the Grand Master of Spain!! What an amazing coincidence!" 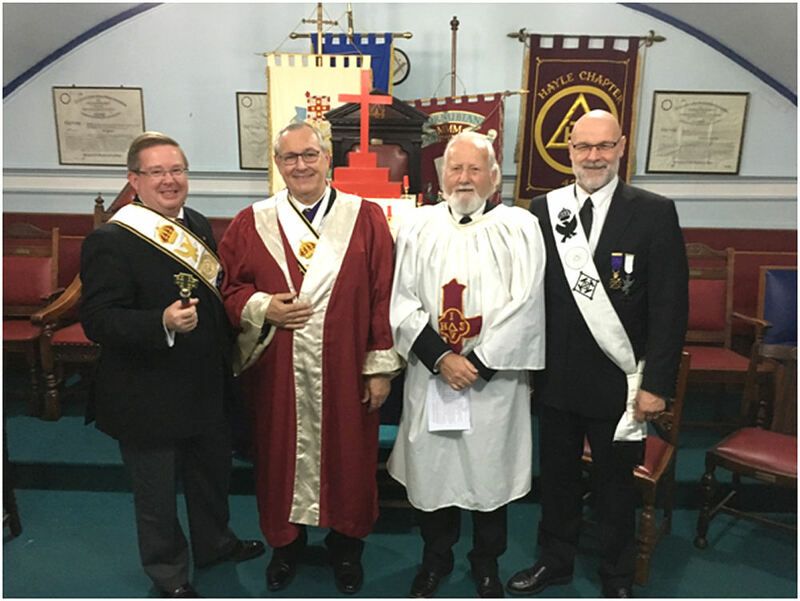 A glorious autumn morning saw the Knights of the Division assemble at South Brent to support Ill.Kt John Lynes and the members of the Conclave. Arriving in good time to have coffee and biscuits as the Conclave was constructed under the watchful eye of the Marshal Ill.Kt. Dr Warner Barton. Many hands made light work of the construction of the paraphernalia of the Conclave and soon we were in position to start. Deputy Intendant General. An exercise that was effectively carried out with the Deputy Divisional Marshall Ill.Kt Roy Ruddling leading the procession and the Deputy Captain of the Guard P.Kt. Peter Durrant controlling the Guard. The Deputy Intendant General suitably acknowledged the courtesy and honour afforded him. The meeting attended to the business of election of officers for Sovereign, Em.Kt. Harry Hine and Viceroy, WKt. David Lloyd being declared by the Puissant Sovereign. We then had a paper relating to the watch words of our order given by P.Kt. Davis Silman, Recorder. This was followed by W.Kt. David Lloyd delivering the Oration in an exemplary manner. The Conclave closed and we retired to a warming and delicious festive board before heading home for an afternoon post prandial snooze…….. zzzzzzz. Mount Lebanon Conclave No.270 - Monday 24th September 2018 - Who's sitting in my chair now? We knew before we arrived that it was going to be a busy night, installing a new member to the Order, Enthroning the Viceroy who had been unable to attend the Enthronement meeting, general business of the conclave and an Appendant Orders Certificate to be presented. Hence the earlier 5.30pm start. PKt Roger Pulleyblank Most Puissant Sovereign, started the proceedings opening the Conclave with the assistance of P.Kt. Roger Goulding as Viceroy and proceeded to welcome the assembled 35 or so knights. He greeted the Intendant General and Deputy in a warm and Christian welcome to the Conclave. He then swiftly dispatched the ordinary business on the Agenda and …….. handed over to V.Ill.Kt George Evatt! A speaking part for George! Wonder of wonders!!! P.Kt. Roger then took over as Viceroy from P.Kt. Roger Goulding who then assumed the responsibilities of Sentinel. Confused yet? P.Kt. Pullyblank, as Viceroy, then installed W.Kt. Gary Peard as Viceroy in an excellent manner with the assistance of Ill. Kt Roy Ruddling as Marshal keeping things running smoothly. Once saluted, another change occurred. P.Kt Pullyblank resumed the Chair of Constantine briefly to then introduce the next item of business, the Installation of Companion Jonathan Alexander Davey. The vote taken confirmed that he was to be installed. All change! P.Kt Roger Pulleyblank then invited P.Kt Barry Slade to take the Chair of Constantine to conduct the Ceremony of Installation. A very generous offer owing to the fact that in his year, P.Kt. Barry, had not been able to undertake a ceremony. It was a faultless ceremony throughout with many beautiful parts to the ceremony carried out flawlessly. Another high spot was the indomitable Ill.Kt. John Lynes once again holding forth in the delivery of the Oration! His experience shone! A final change saw P.Kt. Roger Pulleyblank back in control who then invited the Deputy Intendant General to present the Appendant Orders Certificate to W.Kt. Michael Roy Carter. Due to the hour and that a newly installed Knight was in attendance the short explanation was made with a promise that a full explanation would be made in due course. The Festive Board in the Refectory was once again enjoyed by the Knights present, the speeches short and pithy and the camaraderie excellent. A great way to start off the year for Mount Lebanon and to introduce a new member to the order!” Well done and thank you Mount Lebanon members! A Soggy Sunday morning met us when we awoke and prepared to drive down to Plymouth for the Annual Christian Order Degrees Church service at The Church of the Ascension at Crownhill, Plymouth on Sunday 23rd September. They say that the sun shines on the righteous! Well we must have all been pretty good over the last few days because a s we got closer and closer to Plymouth the sun came out and all was right with the world. When we arrived at the Church the first people we bumped into were Roger Guest and John Whitfield from North Devon! 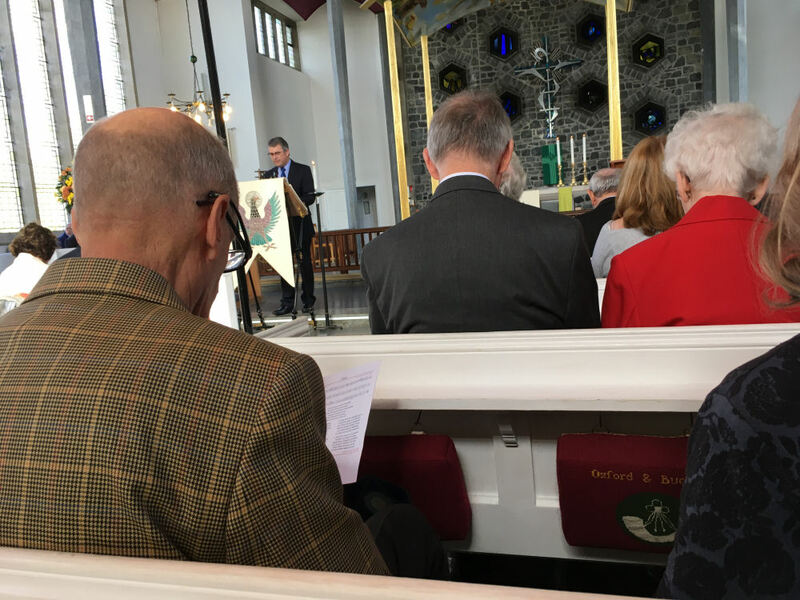 Maurice Eglinton had made a superb job of organising the whole service, taking care of every detail and even adding the sheet music to the Service Order Program. 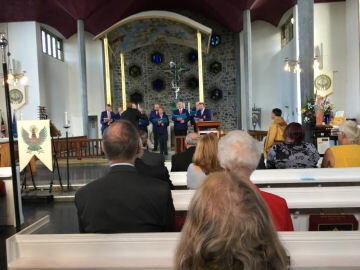 Father Tim Thorp made us all very welcome, and the readings were carried out in very professional manners by Dr. Warner Barton, Richard Lucas and Graham Lea. The Devonshire Masonic Choir, under the leadership of Barrington Sowden, wowed the crowd with two superb performances and all the music was played superbly by Roger Freeman on the fairly new Organ partly funded by Freemasons. After a super and meaningful address by Father Tim, Michael St.J. French thanked everyone and we then had refreshments in the church. We finished off a superb day by joining Richard and Marilyn for a meal at the Jack Rabbit before making our way back to Barnstaple. With the closing of the Conclave of the Resurrection No. 432 in its present form, the warrant is now held by the Intendant-General, whose intention is to continue the Conclave but re-named as a Past 'Sovereigns Conclave'. To date 37 Past Sovereigns have shown an interest in becoming members and are invited to attend a meeting, along with all Past Sovereigns who who have not yet indicated a wish to become a member but who are interested in joining and would wish to know more. 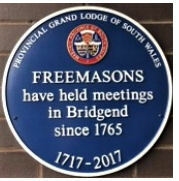 The meeting is to be held in the basement of the Mount Edgcumbe Masonic Hall, Plymouth at 1500 on Saturday 29 September. The use of the basement is necessary as the Refectory and Temple will be in use by other user lodges, so please do not use the main entrance but use the entrance to the basement which is immediately around the corner in Southside Street leading down to the Barbican. Nineteen knights of the division assembled for the Enthronement Meeting of Holy Trinity where P.Kt. Simon Wills was clearly leading his Conclave fromthe front! The Intendant General, his Deputy, were introduced to the Conclave after the customary opening ceremony under the direction of the Acting Divisional Marshal P.Kt Christopher Thomas our Divisional Senior General, showing once again the flexibility of members of the Division in multi-tasking and taking on whatever offices need to be filled at a moment's notice. The Sepulchre Guard, under the direction of the Deputy Captain, P.Kt. Peter Durrant formed an Arch of Steel with members of the Guard present. It was after the formalities of Baton exchange with the Intendant General that we became aware that something out of the ordinary was to happen. The Puissant Sovereign Simon Wills having been declared Sovereign for the ensuing year by the Marshal Ill.Kt Dr Warner Barton, he then exchanged the throne of the conclave with the Immediate Past Sovereign David Ellis. P.Kt Wills then assumed the role of the Viceroy and performed a faultless ceremony of installing W.Kt Paul Lloyd as Viceroy of the Conclave! Following the closing of the College of Priests Mason, P.Kt. Simon Wills again assumed the throne with thanks to P.Kt. Davis Ellis for looking after things while he'd been temporarily otherwise engaged. 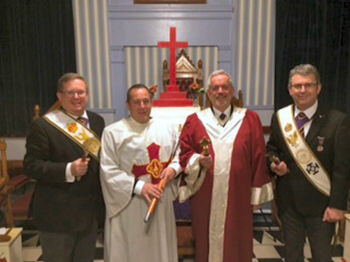 Officers of the conclave that were present were then invested to their posts. ‘A building which by the beauty of its design and the solidity of its construction we trust will be an ornament to this city and Province for centuries to come.’ HRH Edward Prince of Wales. Later King Edward VII. 20th May 1880. It was a slightly overcast day when 20 Knights, family and friends from across the Division assembled at the West Gate entrance of Truro Cathedral to take a guided tour of the impressive building which towers above the rooftops of the City. Our Intendant General and the Deputy welcomed all those present. We had the benefit of two guides, Judith, one of the volunteer guides (as well as an Organist at the Cathedral) and our own Very Eminent Knight Rev. Dr, Peter Blackwell-Smyth. 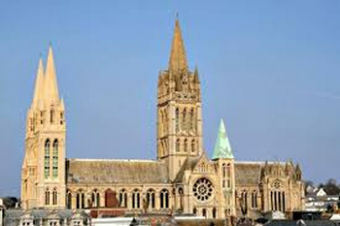 .A winning combination that covered the Ecclesiastical, Architectural and Masonic elements of the wonderful building. Designed by Architect John Loughborough Pearson, in the Gothic Revival style with three spires, the tour took us past a glorious stained glass window in the north nave west area showing the Consecration Ceremony by HRH the Prince of Wales in 1880 in full masonic regalia, up into the West Gallery which showed the best view of the High Alter and an interesting ‘kink’ in the building at the middle of the nave. Architecturally it was included to preserve some buildings near the site containing businesses who had contributed funds to the building, which if the Cathedral had been built perfectly straight they would have been demolished! 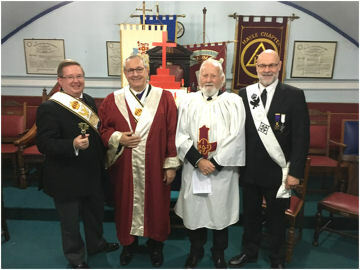 Many other Masonic links were pointed out to us, references to the Earl of Mount Edgcumbe as Provincial Grand Master, the ceremonial trowel used at the consecration as well as the ceiling roundel in place in St Marys Church which forms part of the Cathedral as a commemoration of the recent Tercentenary showing the Cornish Arms and a Square and Compasses. The tour was highly entertaining and full of facts and anecdotes of a church and masonic nature, beautifully illustrated by the magnificent surroundings of the Cathedral. Ending our tour beside the external Foundation Stone, one of three in the building, where the elements of Corn, Wine and Oil and were interned within, we set off for well-deserved refreshments at ‘Yummy Scrummy’ where cakes, cream teas, tea, coffee and Hot Chocolate (John Clendinning!) were consumed with gusto! Ill.Kt. Nic White. Deputy Intendant General. 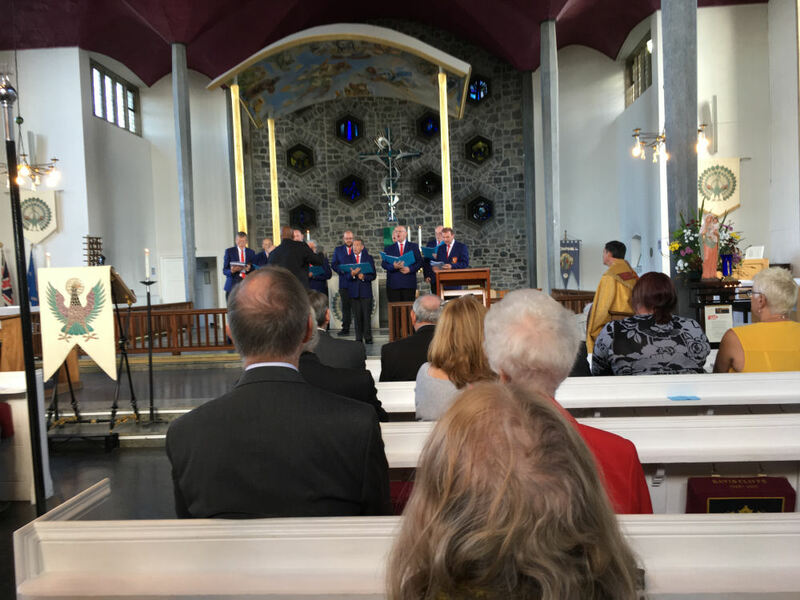 Joseph of Arimathea Conclave No.253 Enthronement- Friday 7th September 2018 - And Sandy came too! What a wonderful opportunity, Joseph of Arimathea Enthronement on the Friday and a guided tour around Truro Cathedral on the Saturday with a little time for some shopping. I couldn't miss the chance of offering to take the Lovely Sandy away for a weekend' s break! The trip down the Atlantic Highway on a glorious autumn day couldn't have been better and we arrived at the 'Mannings Hotel' in Truro with plenty of time for me to get changed for the meeting. On arriving at Perranporth I found that our Intendant General. Rt.Ill.Kt. Richard Lucas had already arrived and we were most warmly greeted by the members of the Conclave. Their recent problems having been overcome by a super display of help and understanding between all of the members, the Most Puissant Sovereign P.Kt Graham Hooper opened the Conclave with ten active Divisional Officers in attendance to support him as well as the Sepulchre Guard led by their Deputy Captain, P.Kt. Peter Durrant MBE, with P.Kt. Chris Thomas standing in as Acting Marshal. The initial business of the meeting having been completed E.Kt. Colin Rescorla then installed P.Kt. Frank Jewell as Eminent Viceroy and he was then himself Enthroned as the Most Puissant Sovereign. Both parts of the ceremony were carried out in an exemplary manner by the respective Senior Officers and their team and M.P.S. Rescorla then appointed his officers for the ensuing year. Following the presentation of the R.C.C. Certificate to W.Kt. George Field by our Deputy Intendant General, Ill.Kt. Nic White, the Conclave was closed and we retired to the refectory for the usual excellent Festive Board found at Perranporth. The evening started off well enough, a good friend offered to pick me up and drive me to the meeting. On arriving at the Lodge I suddenly remembered that I had put a bag of items in my car that were urgently needed for the meeting. A reluctant and pleading phone call to Sandy and, like all of our wives, her support was terrific and the bag quickly arrived. In the meantime my driver had time to confess that earlier in the day, following a meeting of our Widows, he had locked up the building, inadvertently locking one of the Ladies in the Lavatory (isn't there an old song about "an old Lady locked in the Lavatory"?) anyway, out of loyalty and friendship I refuse to reveal Brian Taylor's name! Our Most Puissant Sovereign, P.Kt. Steve Marshall made short work of opening the Conclave and after the Salutations he offered the Baton to our Intendant General (occasionally referred to as 'Inspector General") Rt.Ill.Kt. Richard Lucas. The business meeting of the Conclave then continued with election of P.Kt. Ian Pollock as Sovereign, W.Kt. Brian Taylor as Viceroy and W.Kt. Paul Howard Baker as Treasurer for the forthcoming year. Rt.Ill.Kt. Richard Lucas then presented an RCC Certificate to Michael O'Meara in a most superb and interesting manner, especially bearing in mind that he had ten minutes notice that he was going to do it! The assembled knights then retired for a most enjoyable Festive Board with good food, good wine, and good Christian Company. As I am sure you are aware some problems at the Conclave of Resurrection have caused our Intendant General, Rt.Ill.Kt. Richard Lucas, to consider turning it into a 'Past Sovereigns' Conclave'. This Conclave would meet on possibly two or three occasions during the year at locations to be decided, when items of interest would be laid before the Conclave and where the vast experience of the members could be called on to assist other Conclaves. The full details have yet to be decided and to that end our Intendant General has asked me to contact you to ascertain if you would be interested in taking part in this meeting and also whether you would be interested in joining the Conclave. When I have numbers I will arrange a date and place to hold such a meeting. Yours in F.U. & Z.
Perranporth Appendant Orders 27th July - NOW CANCELLED !!! Unfortunately, it has proved necessary to CANCEL THE APPENDANT ORDERS MEETING OF 27TH JULY 2018. The date allocated to Mount Lebanon Conclave to arrange the Meeting has proved untenable for a number of reasons: there is a clash with other Masonic commitments and the fact that it is the first week of the summer holidays and a number of Worthy Knights who would have undertaken duties are away. There will be a full consultation as regards any arrangements to hold a meeting in the future. There are three Candidates to be catered for. I will return the cheques to those of you who have paid in advance. On behalf of Mount Lebanon Conclave I apologise for the disruption which has been caused. Conclave of Light No.498 Enthronement Meeting - Tuesday 10th July 2018 - Why did the Chicken Cross the Road? 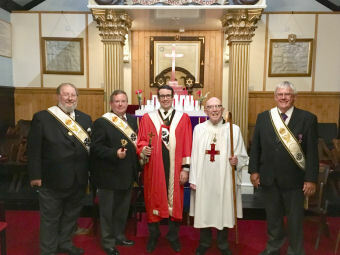 It was a hot day in July when an old man with white hair and a large white beard dressed in a long red cloak delighted over thirty knights at the enthronement meeting at Conclave of Light No.498 in Bodmin by performing a most superb Enthronement Ceremony. I was lucky enough to be driven, together with our Divisional Marshal, Ill.Kt. Paul Ackland and Ill. Kt. Roger Guest, by Ill.Kt. Eddie Dymond in his super posh and very new BMW which, with its buttons to do everything (even open & Close the boot) and its 'head up display' seemed more like an aircraft!! Our Deputy Intendant General led a procession of 8 divisional officers under an Arch of Steel provided by the Sepulchre Guard under the Captainship of V.Ill.Kt. Bernard Winsor (our Intendant General, Rt.Ill.Kt. Richard Lucas having sent his apologies due to work commitments). The Most Puissant Sovereign, V.Ill.Kt. Bill Lissamer and his team then Installed V.Ill.Kt. Roger Duffett as Eminent Viceroy and Enthroned Em.Kt. Andy Patterson as Most Puissant Sovereign for the forthcoming year. The M.P.Kt. Andy then invested his officers in a most efficient manner. The rest of the Conclave business was then completed and the assembled Knights retired to the Westbury Hotel for a most enjoyable and convivial lunch, during which Roger Duffett provided, to all on his table, the answer to that age old question "Why did the Chicken Cross the Road?" You'll have to ask him if you wish to know!!! Grand Imperial Conclave - Tuesday 3rd July 2018 - Our Recorder charms a young lady from France! Picking up Paul Ackland at 6:15 and Mike Jones at 7:00 at Tiverton Parkway we were once again heading to the Great Metropolis to enjoy taking part in one of the most important Red Cross Meetings of the year. 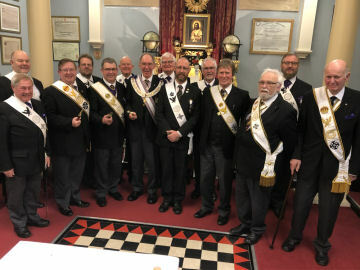 Altogether 21 Knights from Devon & Cornwall attended the spectacle that is the Grand Imperial Conclave held at Freemasons' Hall, Great Queen Street. As seems to have become the tradition, we parked up at Hounslow West tube Station and headed off to Great Queen Street where Devon & Cornwall Knights once again commandeered the pavement chairs and tables for coffee and to watch the comings and goings through the entrance of Grand Lodge, and where a young lady from France fell for the undoubted charms of our Divisional Recorder!! (Don't tell Sandy!!!). We watched, and interacted with many friends until the time came for a quick look around Letchworths the Masonic Shop in Queen Street to see if there were any Masonic items that we desperately needed, and then into the changing rooms and on with the regalia needed to do justice to the Great Hall. After taking our seats, the Grand Sepulchre Guard , resplendent in their magnificent cloaks formed a Arch of Steel for the visiting dignitaries from all over the world and how nice it was to see Barry Slade on his first outing as a member of the Grand Sepulchre Guard! The meeting then got under way and, as usual, was conducted by our Grand Sovereign, M.Ill.Kt. Graham Flight, G.C.C. in his usual calm, relaxed but efficient manner with some humour where appropriate, and the Devon & Cornwall contingent loudly applauded when their own members received their honours. Following the meeting we all retired to the splendour of the Connaught Rooms for a meal with good company and plenty of wine! We left Queen Street just as 'rush hour' was getting under way, and the trip by tube train back to Hounslow was hotter then most Saunas that I've been in and reminded us all how lucky we were to be living in the West Country. An uneventful drive allowed us to be home by 10:00pm. A long day, but a most enjoyable day, and congratulations to all those who received well deserved Grand Honours! A lovely day, beautiful scenery and a daytime meeting at Conclave of Ascension No.499 at South Brent in the company of good Christian Knights - what more could anyone want from a day? Twenty three Knights, which included our Deputy Intendant General, Ill.Kt. Nic St.J.M. White, who presided over the meeting, our Intendant General carrying out other Masonic Duties in Bristol, witnessed a superb ceremony by that 'once again re-cycled' Most Puissant Sovereign John Lynes and his team. The knights then retired to the refectory for a most enjoyable Festive Lunch with good food and good Christian company. 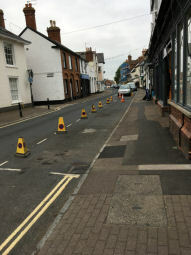 St. Ercus Conclave No.349 meeting - Tuesday 19th June - why do the police do that? Having just had my driving licence returned after an eight month ban, caused by a suspected seizure, I was looking forward to a pleasant drive down the Atlantic Highway to attend the meeting of St. Ercus Conclave No. 349 at Hayle on Tuesday 19th June. However my pleasure was ruined when the A30 near Camborne was closed by the police due to an accident, and my spare 45 minutes arrival time was reduced to nothing in the crawl through the back lanes to Hayle. 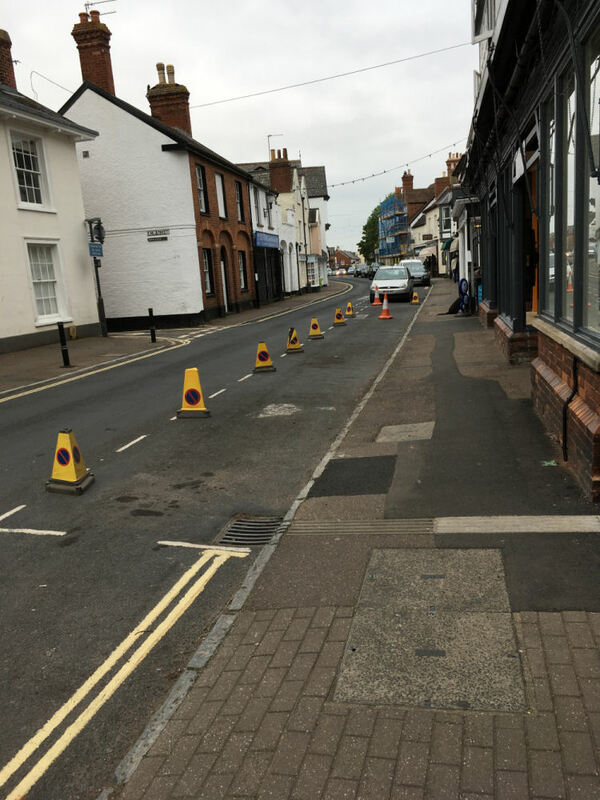 Why do the police insist on totally closing a road following an accident? and why do they seem to spend more time and manpower on investigating a RTA. than they do in investigating burglaries and violence? Anyway, having arrived just in the nick of time! It transpired that the journey had been well worth while! 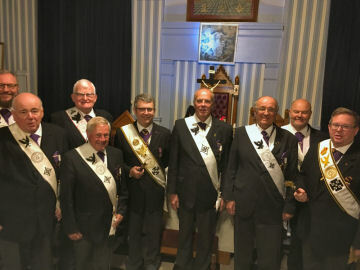 The assembled knights, including our Intendant General Rt.Ill.Kt. Richard Lucas and our Deputy Intendant General Ill.Kt. Nicholas St.J. M. White as well as our Divisional Viceroy, V.Ill.Kt. Bill Lissamer' were treated to a faultless ceremony by the Most Puissant Sovereign, M.P.Kt. Paul Goody and his team when they installed Comp. Alec Dennis Savery as a knight of our order. This was followed by the elections of E.Kt. Marc Quigley-Ferriday as Sovereign and W.Kt. Paul Roberts as Viceroy for the forthcoming year. The Knights then retired for a most enjoyable festive board, and, the A30 having been re-opened, I was still home by 11:30pm! And what a pleasure it was to have our past Divisional Recorder V.W.Kt. George Evatt OBE as one of the visitors and to enjoy his sometimes 'wicked' sense of humour!! It is with a sad heart that I have to report that another of our Knights has been called to the Grand Lodge above. P.Kt. John Charles Summers passed away on 15th June 2018 at the grand age of 80. 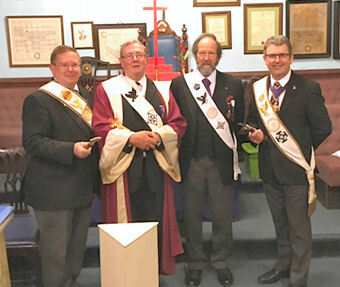 He joined St. Brannock Conclave No.342 in 2000 and was its Recorder from 2008 to 2015 during which time he introduced several candidates to the Order. He was also very active in many other degrees. John had been ill for some time, particularly since he was taken into hospital in October of last year. As soon as I know details of the funeral I will let you know. John was a very good friend to many of us and he will be sadly missed by all! St. Brannock Conclave No.342 Meeting - Thursday 14th June 2018 - who's the Daddy? Over 30 Knights from all corners of our Division braved the Summer Traffic to attend the Official Visit to St. Brannock Conclave No.342 on Thursday 14th June. Our Intendant General Rt.Ill.Kt. Richard Lucas, accompanied by our Deputy Intendant General Ill.Kt. Nicholas St.J. M. White and eleven active officers entered the Conclave under an Arch Of Steel provided by the Divisional Sepulchre Guard, led by their Captain V.Ill.Kt. Bernard Winsor. The assembled Knights were then treated to a superb ceremony when Comp. Michael O'meara was installed as a Knight of our Order by the 'new' team headed by the Most Puissant Sovereign M.P.Kt. Steve Marshall in his first ceremony. The other business of the evening was then conducted and the Knights retired to the refectory for a superb festive board of Ham Salad with all the trimmings, and Strawberries and cream. And the 'who's the Daddy' reference? Not only did our candidate perform superbly but he had also left his wife at home with their newly born daughter!! St. John the Evangelist Conclave No. 238 Enthronement - Tuesday 5th June 2018. As you can see from this photo the Knights of St. John the Evangelist Conclave were good enough to reserve a parking space close to the Conclave for our Intendant General Rt.Ill.Kt. Richard Lucas! Unfortunately they hadn't been told that he would be unable to attend the Enthronement due to a very important Masonic Commitment in London. Bet they won't reserve him a parking space again!! Richard's place was very ably taken by our Deputy Intendant General Ill.Kt. Nicholas St.John Middleton White who, after we had all received a very warm welcome by the Knights of the Conclave, presided over a 'quite different' Enthronement! The 'differences' came about because both Alexander Barahona-Wills, the incoming Sovereign and John Lines, the incoming Eusebius had both already been through the 'Chair' (John making his third appearance as an Eusebius!). Despite the differences, both the Installing Most Puissant Sovereign, Michael Jones, and the Viceroy, Alexander Barahona-Wills made a superb job of carrying out the ceremony, ably assisted by the Marshal P.Kt. Mike Daniels. The evening culminated in a most enjoyable Festive Board with good Christian Company - especially the three wise men from Brixham!! The sojourn across Dartmoor from all directions to the Ancient Stannary town of Tavistock saw the gathering of many Knights of the Division to attend the Enthronement Meeting of Mount Lebanon. There was a warm welcome for all who had made the journey, coffee, tea and biscuits that were well received by the travellers. We soon were marshalled into the Temple where we witnessed a superb ceremony conducted by PKt. Barry Slade, more than ably supported by the Conclave Marshal V.Ill.Kt Roy Rudling the Divisional Deputy Marshal. The conclave saw E.Kt Roger Pullyblank placed in the seat of Constantine confidently and with sincerity. We repaired to the refectory in good time to enjoy a delicious meal and listen to short speeches in great company. Another fine Red Cross of Constantine meeting, thank you members of Mount Lebanon Conclave for an excellent meeting.